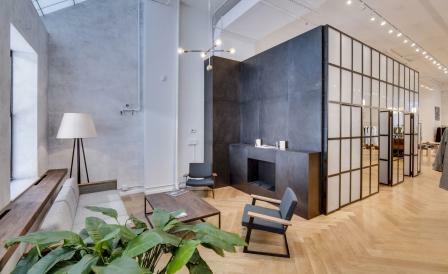 An industrial building in SoHo has been transformed into a slick new shop, by local architects Emporium Design, who melded the original building details and mid-century modern elements to create an understated atmosphere that seamlessly complements the carefully curated menswear on offer. White 18-foot cast iron columns, in the centre of the room, act as pivots for the brushed stainless steel racks that are adorned with select pieces from brands such as JW Anderson, Marni and Neil Barrett, while further items line the edges of the room, creating a sense of space, in which to browse freely. Bespoke walnut wood shelving and freestanding mirrors, along with the smooth oak flooring underfoot, temper the blackened steel and frosted glass fitting rooms, while pendant lighting fixtures by New York-based Apparatus Studio, throw a warm cast over the room, already flooded with natural light from the angled industrial windows above. For some time out, meander over to the lounge area, which cosied up with Børge Mogensen Spanish chairs, furnishings by local studios Token and Uhuru and natural walnut and birch tables by Emporium Design, is located right next to the fitting rooms, making it the perfect spot from which to view your shopping companion’s change of outfits.